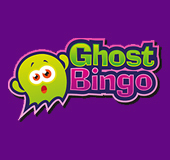 Ghost Bingo floated on the bingo scene in November 2016. The design is pretty simple, with a cute little ghost mascot reminiscent of Pacman games set against a deep purple background. The theme isn’t spooky at all and falls more into the cute bingo sites category. This new bingo site is brought to you by Cozy Games and running on the Best Bingo Network, and you may be familiar with other sites like Big Heart Bingo that runs similar promotions and games. Along with a nice selection of bingo, slots, scratch cards, and casino games, Ghost Bingo offer some really amazing bonuses, like giving away £10 for free- just for signing up! 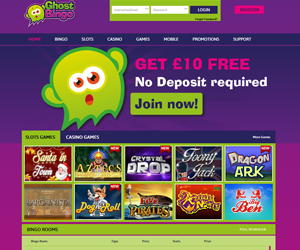 As a new player at Ghost Bingo, you will get free £10 no deposit bingo bonus as soon as you register! You can have a blast playing free bingo games and when you’re ready for more bingo fun you can claim an extra bonus! Get 400% Welcome bonus for only £10 so you can start playing with £50 right away! Once a funded player, you can expect generous reload bonuses on every deposit. Get 350% on your second deposit, 300% on your third, and up to 450% on every single deposit you ever make at this fun new bingo site! Ghost Bingo has loads more exciting promotions every day like Free Bingo where you just need to enter to get 10 free tickets! The room is open 24/7 with six games playing every hour for your chance to win real prizes! You can also get up to 20% cashback every week, and unlike other sites, you can choose the day you want to claim it! There is loads more on offer at Ghost Bingo including chat games, refer a friend, Break-Time Quizzer, and Jackpot specials! Bingo lovers can choose from a top selection of online bingo games and along with the classic 75 and 90 ball varieties you’ll find 30, 50, and 80 ball games as well. There are UK themes games playing all the time like Big Ben, London Hall, and Down Town bingo! You won’t want to miss games like Daily Jackpot, with a top prize of £500 and bigger seasonal games with prize pots of up to £10,000. If you also like playing slots there are plenty of top titles and exciting themes to choose. Play Irish themed slots like Lucky Clover and Irish Gold or UK themed slots like Elizabeth: the White Queen and Brittonaire slots. The free bets section includes free slots Lucky Devil, Rolling in the Dough, and Big Ben. Go on to play classic casino favourites like Roulette, Blackjack, Deuces Wild and more! You can take Ghost Bingo on the go when you play on your smartphone and tablet! You can play from a range of devices including iPhone, iPad, Android and Blackberry and access all the bingo fun from the palm of your hand! Spin top slots and claim fantastic bonuses (including your £10 no deposit bingo bonus!) on the go with Ghost Bingo! So if you want some spook-tacular fun Ghost Bingo is one of the new bingo sites to check out this year!